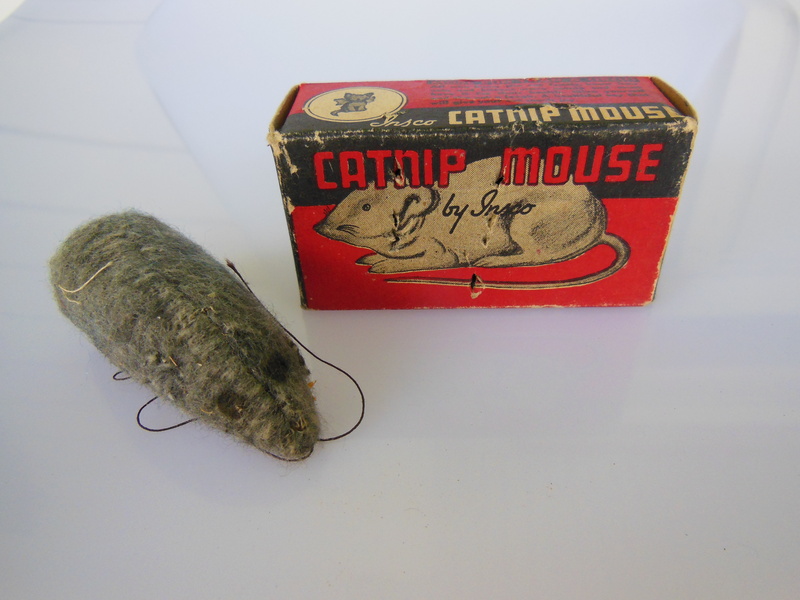 On February 9, 1916, twenty-one-year-old Evelyn M. Ludlam of Waltham, Massachusetts applied to the U.S. Patent Office for a patent protecting her “new and useful Improvements in Catnip Mice.” The “simple, inexpensive toy” was stitched together from two pieces of fabric, had a “string or cord” tail, bead eyes and ears made from small pieces of the same cloth as the body. “By constructing the envelop (sic) of cloth,” the application noted, “the feline will be able to pick it up with its claws and throw it about, and also chew the same without injury to its teeth until it has destroyed the envelop, permitting the contents to escape and thus be devoured by the animal.” This is an accurate depiction of my own cats’ behavior with catnip mice…. 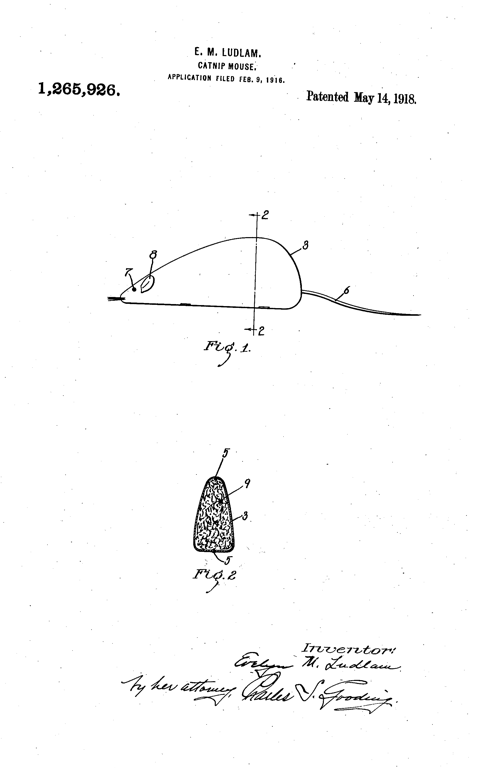 Drawing for Patent 1,265,926, Catnip Mouse. Evelyn M. Ludlam, Waltham, MA. Patented 14 May 1918. Shaping cat toys into “mice” follows a convention seen in all sorts of pet toys. To be amusing to pet owners, toys for cats and dogs have to be shaped like something that has an association with the particular animal — a rubber dog toy shaped like a leg bone, for example — but the objects are transformed in a variety of ways. They may be scaled differently, or made of less objectionable materials to have around the house. A cat owner could theoretically provide a cat with a conveniently dead mouse to play with (and I know that I have found chewed mouse carcasses on my kitchen rug many mornings), but neither our sensibilities nor our rules of household sanitation allow that kind of plaything to hang around. It’s possible that Evelyn Ludlam wasn’t the first person to come up with the idea of a cat toy shaped like a mouse, but the timing of this patent does tell us something about the changing status of some pet cats, who didn’t have to work for a living anymore. As I wrote in my earlier post about catnip, the herb was considered healthful for housecats, and people used it to treat their own indigestion, too. 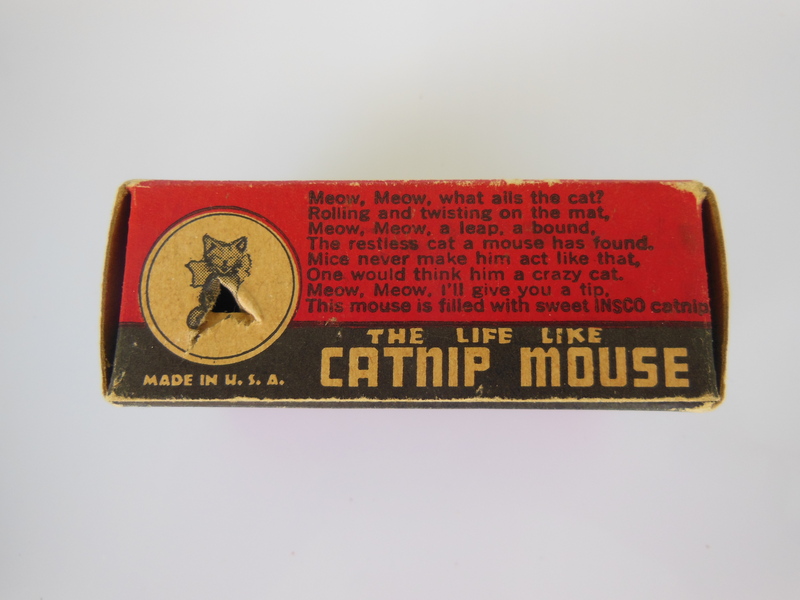 Catnip mouse, Insco Company, United States, no date. After a 27-month wait, Evelyn M. Ludlam got her patent for the Catnip Mouse. I’ve been unable to find any evidence that she made them for sale or benefited from the patent. In 1917, she married Walter Clifton Conroy of Cambridge, Massachusetts, who appears in the 1920 Census as an “Electrical Assistant” on “the Electric Railway.” The catnip mouse, however, has enjoyed a long career as a cat toy of choice, and I illustrate an example from my collection. This example, which I date to the 1940s or 1950s based on the graphics on the box, is the same shape as Evelyn Ludlam’s patented mouse. What I especially love about this toy and its box is that both have been well used. The mouse has been chewed, and the box itself has tooth and claw marks that suggest the enthusiasm of the toy’s recipient. The marks are the traces of daily life with pets from long ago, the kind of special evidence that only artifacts can provide. Meow, Meow, what ails the cat?/Rolling and twisting on the mat./Meow, Meow, a leap, a bound,/The restless cat a mouse has found./ Mice never make him act like that,/One would think him a crazy cat./Meow, Meow, I’ll give you a tip./ This mouse is filled with sweet INSCO catnip.